If you love paper, then you have to know about the French Paper Company, established in 1871 in Niles, Michigan. They have a great selection of paper that we have used for a variety of projects in the past from pop-tone, mod-tone, pattern-paper, and muscle-tone. We love the stuff and can’t get enough of it! 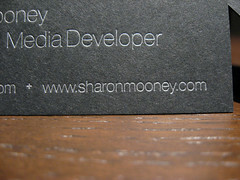 We printed these letterpress business cards a while back for Sharon Mooney, a designer/developer (we love her URL: www.gosharongo.com). 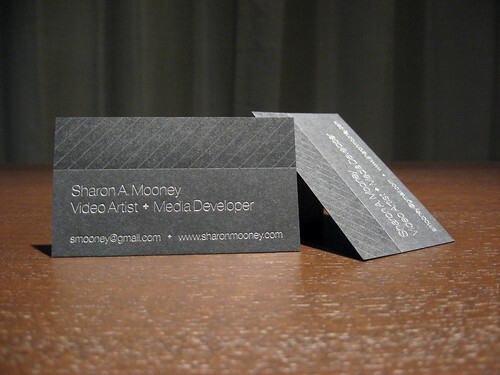 Sharon designed the cards with silver metallic ink and a blind deboss on black muscletone. We added varnish to the blind deboss to increase the contrast of the diagonal stripes. Muscletone is a great choice for business cards, the 140lb. stock is thick and rigid and gives a nice impression. 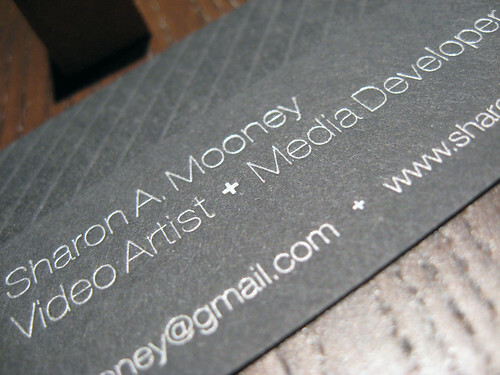 These closeups of the cards show how gorgeous silver ink looks on black stock. 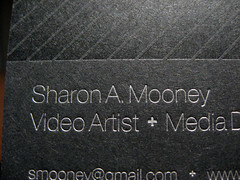 The thin lines of the silver text provide a simple/elegant contrast to the black paper. What’s your favorite paper stock? Share you opinion below.